kt literary » Blog Archive » Happy Book Birthday to Wen Baragrey! Happy Book Birthday to Wen Baragrey! 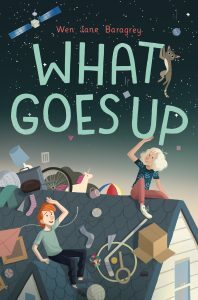 Happy Book Birthday to Wen Baragrey whose debut middle grade novel, WHAT GOES UP, releases today from Random House Children’s Books! 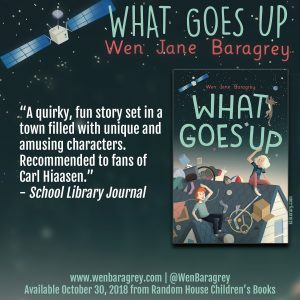 WHAT GOES UP is the perfect middle grade novel for kids from weird families – Just Like Mine! (no kidding – check out twitter for the story of my dad and the banjo). What goes up . . . comes down on Robyn Tinkerbell Goodfellow’s roof! Will a rogue NASA satellite crush her house before Robyn can set things right? Robyn Tinkerbell Goodfellow (yes, that’s actually her name) has a target on her roof. Well, not a real one, but everything seems to land there: paper airplanes, lost kites, socks, cats, and once even a skydiver! In the town of Calliope, Robyn and her magnet roof are famous–for being weird. That wasn’t such a big deal . . . until now! A rogue NASA satellite is falling out of orbit and is going to hit Earth. NASA says it will probably land in the ocean, but Robyn knows better–that satellite is headed for her roof. To make matters worse, Robyn discovers that she doesn’t just have a fairy middle name. When her class reads A Midsummer Night’s Dream, she learns that Robin Goodfellow is a fairy! Which means if the satellite flattens her, everyone will laugh at her name in the news stories. Robyn realizes what she needs to do: find her long-lost dad so he can help her change her name and protect her from the satellite! Both surprising and relatable, this middle-grade novel will have readers wishing they could move to the small town of Calliope, laugh with the larger-than-life characters, and race against the clock to save Robyn from NASA’s mistake. ← SOLD! Congratulations to Gerald Brandt!